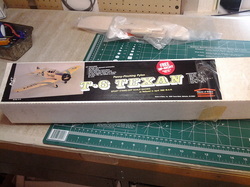 Just acquired via eBay an old House of Balsa T-6 Texan Sport Stand-off scale racing kit "as featured in April 1982 M.A.N." It is a new old kit, complete. Wingspan is 44", designed for a .10 to .19 engine. 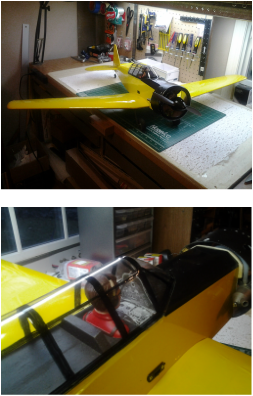 It may be my next build, putting the Fokker V.23 back a while. 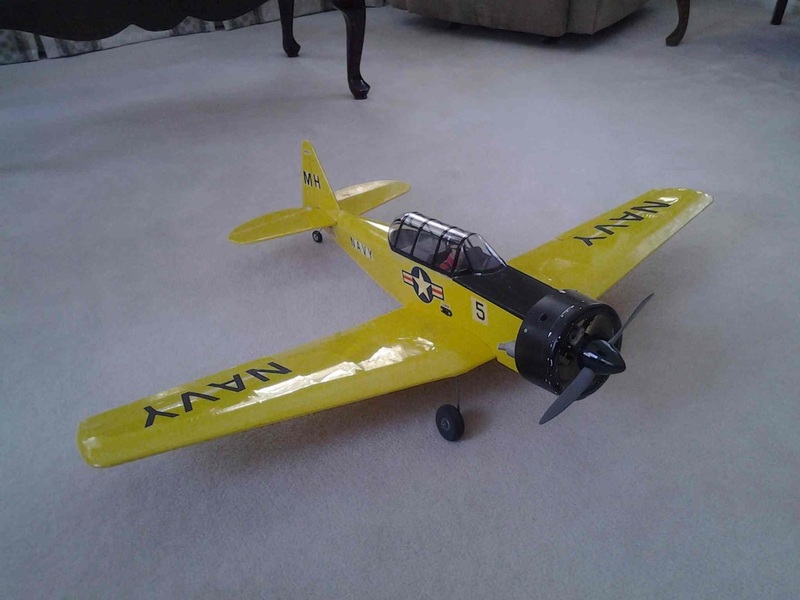 11/12/15 A month or so ago I finally had the plane ready to try again. Engine fired up and ran "perfectly." I use quote marks as I've learned NO engine every stays running perfectly even if it seems to now and then - at least mine! I put it on our grass strip and gave it the gas... It taxied, picked up speed... but not quite enough to get off the ground! It seems to me that the little .15 engine just doesn't have enough oomph to get up to flying speed on grass. I intended to take it to the nearby state recreation area which has a paved strip but never made it before the fall cold, rain and winds set in. Maybe next season! Or maybe I should just hang it from the ceiling and look at it! 11/13/14: With winter coming and outside flying days limited or gone for a while I decided it was time to build this kit. The result is at the right, representing several weeks of work. The build was straight forward except for the cowl. The original plan called for the bottom off a 2 liter soft drink bottle but those have been history for quiet a while. 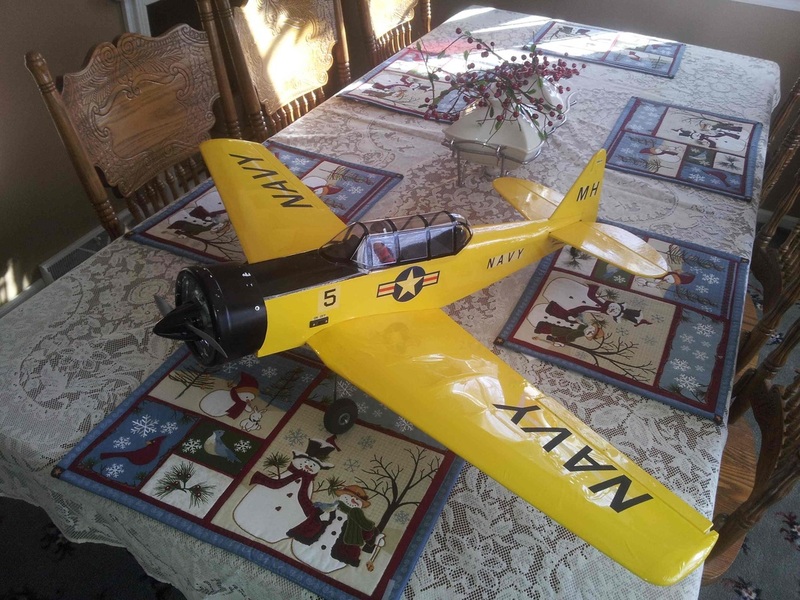 The kit included the balsa and thin plywood to build one but my engine (ASP S15A is a bit larger than the one specified and wouldn't fit in that. So I went shopping and found a Clorox sanitary wipe container that I was able to cut down and make work. I'm a little concerned about how the temperature of the muffler which is only about 1/8 inch from the container wall will affect it. My son suggested putting aluminum foil tape used to seal furnace exhausts which I have put inside the plastic. Hopefully it will reflect the heat. I'll find out next Spring when it is warm enough to give it a try. 12/10/14: The Texan is now completed and hanging on the wall awaiting good weather - probably two or three months from now. 1/7/15: Been busy working on my Cessna 170 but while I contemplate the best way for me to attack the engine cowl decided to "finish" the T-6. Construction was already completed but had not put any insignia or lettering on it. So that has changed. I downloaded some purportedly "Navy" fonts for Word and then printed out the lettering and insignia which I also downloaded on Avery 8665 Clear Full Sheet Label material. I'm overall pleased with the result. Now it is ready for this 6 degree F weather to go away! 1/14/15: Have been concerned about the decals I printed knowing they are not water or fuel resistant. It occurred to me I might be able to cover them with clear Monokote. So today I did that. Only time will tell if that is a good approach but for now they are sealed between the yellow and clear Monokote.